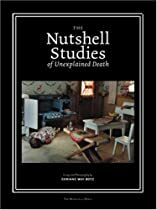 The Nutshell Studies of Unexplained Death offers readers an extraordinary glimpse into the mind of a master criminal investigator. Frances Glessner Lee, a wealthy grandmother, founded the Department of Legal Medicine at Harvard in 1936 and was later appointed captain in the New Hampshire police. In the 1940s and 1950s she built dollhouse crime scenes based on real cases in order to train detectives to assess visual evidence. Still used in forensic training today, the eighteen Nutshell dioramas, on a scale of 1:12, display an astounding level of detail: pencils write, window shades move, whistles blow, and clues to the crimes are revealed to those who study the scenes carefully. Corinne May Botz’s lush color photographs lure viewers into every crevice of Frances Lee’s models and breathe life into these deadly miniatures, which present the dark side of domestic life, unveiling tales of prostitution, alcoholism, and adultery. The accompanying line drawings, specially prepared for this volume, highlight the noteworthy forensic evidence in each case. Botz’s introductory essay, which draws on archival research and interviews with Lee’s family and police colleagues, presents a captivating portrait of Lee.